Living in polar climates can be quite difficult, and staying warm can often be such an issue. But not anymore with the heat sponge! This nifty little organ draws heat from even the coldest water to keep you warm. How does it work? I’m glad you asked! Frigid sea water is taken into the organ, which is insulated to protect against thermal transfer. Upon reaching maximum capacity, the heat sponge initiates endothermic chemical reactions that proceed to absorb small amounts of energy from the water, cooling it further. The products from the endothermic reactions are then transported into the body and “burned” as fuel to provide heat for the creature. It’s that easy! So sales pitch aside, here is the dilemma. While I know that there are endothermic reactions that can occur at low temperatures, I don’t know if they could be used this way, or if this type of heat transfer is even theoretically possible. So the question is could this method of drawing heat from a cold object and transferring it to a living creature work within the realm of physics. If it is theoretically possible but we don’t know if anything that actually does it then that’s fine. If anyone does know of a physical process that could do this, or if anyone has any better ideas that could still produce the same effect, I’m all ears and generous with bonus points. I personally like this idea because it also justifies a creature being able to fire blasts of freezing water/ice as a breath weapon, which is very cool (bad pun I know). What you have described is a chemical battery and a thermo-electric heat pump all neatley packaged as a sponge. Researchers at Ulsan National Institute of Science and Technology (UNIST) in South Korea will be working to develop a new battery, using abundant and readily available seawater. [A] Peltier heat pump involves multiple junctions in series, through which a current is driven. 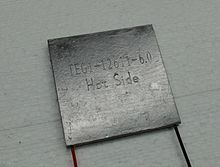 Some of the junctions lose heat due to the Peltier effect, while others gain heat. Thermoelectric heat pumps exploit this phenomenon. They range in size from the tip of a finger to bigger than your palm and start at less than the price of a fancy cup of coffee. Yes, the physics sais it's possible, how to integrate this into a creature's body is more of a detailed technical challenge. The chemical battery is straightforward, different metals laid down in layers separated by porous structures, that allow salt water to enter - straightforward. The Peltier side - that would also be different metals laid down fused at alternating edges, with current passing from one end of this concertina shaped tissue to the other, the heat being drained from one side to the other - again straightforward. This is more or less how a modern refrigerator works. Sea water, even though cold, still contains 'some' energy, and that energy, in theory, can be captured through Convection. Put simply, certain fluids and gases are capable of absorbing heat energy really well, thus cooling down the environment around them by extracting their heat. Refrigerators do this with gases like Chloro-fluoro-carbons (CFCs, in the old days when we didn't care about climate change) and more recently, tetrafluoroethane. Once the gas has absorbed the heat, it is transferred to heat sinks like radiators (which used to be on the back of old fridges) to dissipate. In your creature however, it transfers through the body in a circulatory system, like arteries & veins, or the lymphatic system. In point of fact, the lymphatic system would probably be ideal to extend to this unique heat & energy distribution model. Once you have the heat, how that transfers to energy that the body can use isn't that hard to imagine; ultimately while it's hard to envisage, that's what most creatures do when they eat; they release the stored chemical energy for their own needs. In this case, the energy is absorbed directly from the environment through an exotic form of gas or fluid instead. If your creature used this heat to create its own chemical energy stores, pretty much like a plant does with photosynthesis, then you don't even really have to mess too much with exotic biology beyond refrigerant gases. The key problem with this model is that most of these refrigerant gases are toxic or at the very least, damaging to the environment. But, it's possible that a creature could evolve such a gas in their system that acts like a form of refrigesynthesis, drawing heat from the outer (already) cold environment, and you could still use the even colder water as a weapon like you describe. Given that you're already doing this in water, you could even put some of it aside to use to generate the carbohydrates and oxygen you need for your creature to survive . You're describing a chemical heat pump. Perhaps one of the best known examples is the Einstein-Szilard refrigerator. It can work with several chemical mixtures (the best one so far claims to be as much as 400% more efficient than the original butane/ammonia mixture). Basically, heat from the body is used to drive an absorption/resorption cycle that keeps some part of the animal way colder than the environment by boiling some organic mixture. Maybe the beast could use specialized muscles to expand the mixture-containment vessel, reduce the pressure inside and have it boil that way. In the end, the animal expends say 100 kCal to drive the process; this heat goes to supplement the body heat, and so go another 100-200 kCal from the environment. This way, the animal can gain up to 300 kCal at the end of the process, having expended only a third of that. The heat-collecting organ should probably be shielded by a specialized insulator, probably a rete mirabile ("wondrous network). In theory both butane and ammonia can be produced by the body, in practice you'll probably want something more manageable. To prove this consider the following: If the heat sponge you describe can do this passively (without additional energy), then it could be used to create a perpetual motion machine of the second type which has been proven to be impossible. If instead it uses something in the water as fuel (like plankton, or fish) then it is just like any other warm blooded animal that has to eat to stay warm. Another solution is simply pouring sodium into the water because it reacts with water and ignites it. Like this. To get sodium free you need water and salt. When you got these two ingredients you could use the electric eel cells to conduct electrolysis with the product you again use electrolysis to produce your free sodium which you can pour into water to get this result. Which produces heat like any other fire. Not the answer you're looking for? Browse other questions tagged biology creature-design physics chemistry or ask your own question. How can my creature use explosives to get the maximum bite force/speed?